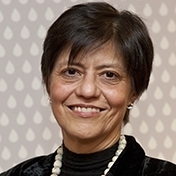 Dr Blanca Jiménez Cisneros was born in 1958 in Mexico. She holds a degree in Environmental Engineering, with a specialization in water, from the National Autonomous University of Mexico (UNAM, 1980), a Masters degree (1982) in Environmental Engineering and a PhD (1985) in Water and Wastewater Treatment from the Institut National des Sciences Appliquées (INSA) in Toulouse, France. Dr Jiménez has 31 years of professional experience with the National Autonomous University of Mexico (UNAM), her base since 1980. In the course of her professional career, she has held the following positions, some of them as part of sabbatical visits: research engineer for Lyonnaise des Eaux, Paris (1985); deputy coordinator of the Water Quality Department (1991-1992) and coordinator of the Human Resources Development Department of the Water Sector at the Mexican Institute of Water Technology (IMTA); coordinator of the Environmental Engineering Department at UNAM (1988-1989); Deputy Director of the Hydraulics and Environmental Department at the Engineering Institute at UNAM (1991-2001), the only woman to have attained this position until now; as well as leader of the project to control helminths eggs and reuse sludge from dry toilets for agricultural production at the University of Pretoria in South Africa (2005). From 2009 to September 2012, she was a Professor and Head of the Treatment and Reuse Group at UNAM. Dr Jiménez has authored more than 460 publications (books and book chapters, papers in journals, norms, standards and patents) which have received around 3000 citations. Her fields of expertise include: water and wastewater treatment and reuse technologies; sludge treatment and revalorization projects; water and health, urban water, development of achievable norms to control and prevent pollution in developing countries and countries in transition; evaluating and maximizing benefits of non-intentional or incidental water reuse (recently denoted as ‘de facto reuse’). She has been the President of the Environmental and Sanitary Engineers, the Environmental Engineer’s Association, and the elected President for the Mexican Academy of Sciences. Among her most outstanding positions, Dr Jiménez has chaired various Mexican and international scientific, professional and editorial groups. She is the coordinator of leading authors for the freshwater resources chapter under the adaptation group of the Intergovernmental Panel on Climate Change (IPCC). In parallel, she has collaborated with 15 international groups and provided consulting services to 31 technological projects for local and national governments, as well as UN organizations and private enterprises in Mexico, other developing countries and countries in transition. She was also a member of the Nominating Committee for the Stockholm Water Prize (2007-2012). Dr Jiménez is the recipient of several prestigious honours and awards, the most remarkable being the Royal Order of the Polar Star (2002) delivered by His Majesty King Carl XVI Gustaf of Sweden; the National Environmental Merit Award (2006); the shared Nobel Peace Prize (2007) for her participation in the fourth IPCC Report on Climate Change; the Mexican National Science and Arts Prize in Technology and Design (2009); and the Global Water Award (2010) of the International Water Association. For some of these awards, she was the first person from the developing world to receive them, and in some cases the first woman. Dr Jiménez joined UNESCO in 2012 as Director of the Division of Water Sciences and Secretary of the International Hydrological Programme (IHP), the first woman appointed to this post. From 2014 until early 2016, she also served as Vice-Chair of UN-Water, the United Nations inter-agency coordination mechanism for all freshwater and sanitation-related matters.